Grintax 60 tablets order online. Eleutherococcus contributes to more mental and physical energy in case of fatigue and helps strengthen natural resistance. Eleutheroccus senticosus (312.5 mg/2 tab): better known as Siberian ginseng. 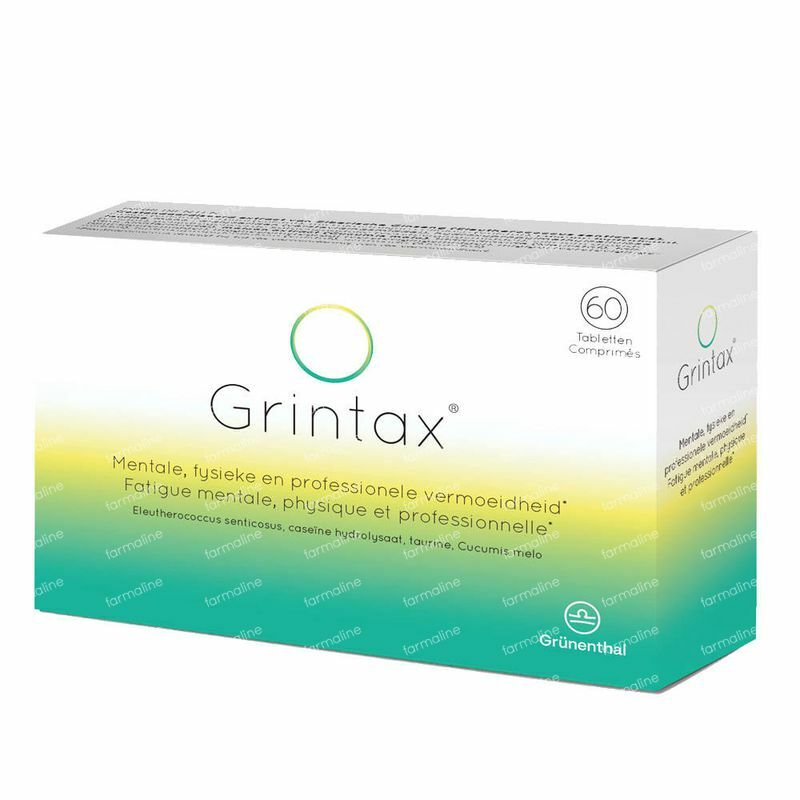 The active ingredients in Grintax® are standardized on eleutherosides that help support the body's ability to adapt. Cucumis Melo (10 mg/2 tab): is a tested melon extract, which is particularly rich in superoxide dismutase. Taurine (100 mg/2 tab): an amino acid-like substance that is popular among athletes. Casein hydrolysate (150 mg/2 tab): is one of the most important milk proteins. It is easily degradable in essential amino acids necessary for the synthesis of other proteins. Contributes to more mental and physical energy in case of fatigue and helps strengthen natural resistance. Once a day 2 tablets with water at breakfast. Minimum 3 months for optimal effect. Standardized extract of Siberian Ginseng (Eleutherococcus senticosus), inulin (filler), sorbitol (filler), microcrystalline cellulose (filler), casein hydrolysate, taurine, mono-, diglycerides (firming agent), hydroxypropyl methylcellulose (filler), hydrogenated cottonseed oil (firming agent), silicon dioxide (anti-caking agent), melon extract (Cucumis melo), titanium dioxide (colouring agent), talc (anti-caking agent), magnesium stearate (firming agent), miglyol (firming agent), hydroxypropyl cellulose (filler), iron oxide (dye). Not suitable for pregnant women or when breastfeeding, in case of kidney disease, lactose intolerance and for children under 12 years.